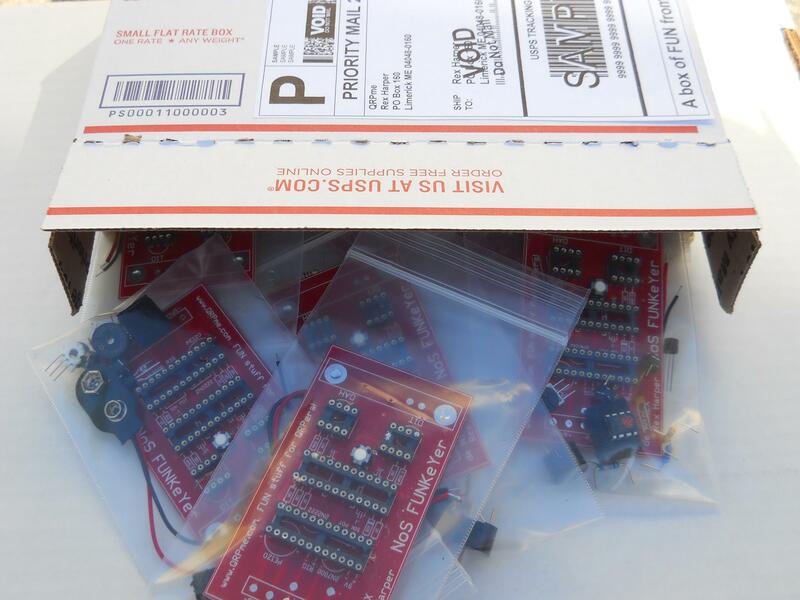 A 10 pack of the FUNKeYer NoSolder keyer kits. FUN on the Bus with the FUNKeYer! What the heck is it? The FUNKeYer is a simple Morse code keyer with a bit of a twist. It does NOT require a soldering iron to build it. It also has a two FUN Morse code game modes and another two modes where it acts as a simple keyer. I have designed it with machined pin sockets for inserting the parts, pre-soldered the sockets AND cut and pre-bent all the parts for easy insertion without (hardly) any tools at all. Builders with nimble challenged fingers will find a small pair of needle nose pliers quite useful..and builders with *ocular noseeum the teenie tiny numbers and letters syndrome* would find a small lighted hand magnifier a welcome sight. A small flat bladed jewelers screwdriver to nudge pins into holes can also come in handy...BUT you WILL NOT need a soldering iron! When you apply 9 volt battery power for the first time, the FUNKeYer starts up in Mode#1. It spins its wheels until you press the middle white button tactile switch which serves as the memory switch. Let it spin a bit as it is randomizing internally. Press the button and the FUNKeYer will beep once to tell you it is now in Mode#1. The side tone frequency will be set randomly between 500 and 2000Hz. It also picks a random 7 letter secret word from an internal table. Now you can send dits and dahs to your hearts content on the red topped tactile switches and the FUNKeYer will complete each dit and dah perfectly as per the speed setting on the trimmer potentiometer. Take away the power and reapply and it will automatically power up in Mode#1 with the same side tone frequency and secret word. FUN: With 55 FUNKeYers built and running on the bus, the audio of all the side tones and call signs and secret words will cram the cilia in your ear with signals like a pileup at a Dxpedition! Pick a signal and follow it for a bit to sort the secret word and call sign out from the din. Move on to another station... who can dig out the most stations? Mode#4: straight key is again similar to Mode#3 but with straight key operation instead of 2 button keyer operation.